Mooie rustige kamers ... Samen met mijn vriendin een topweek gehad in Riad Hannah. Service en eten waren goed! De medewerkers waren behulpzaam en erg vriendelijk. An authentic Riad? A boutique hotel? For people who do not know what a riad, Riad Hannah is a city hotel. 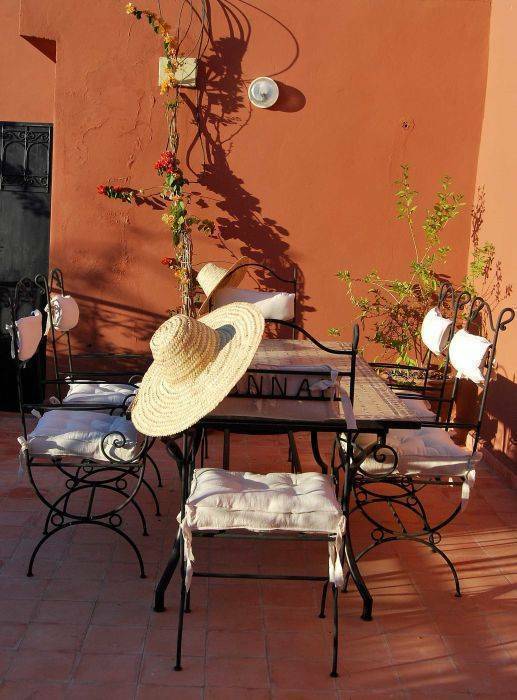 Riad Hannah is both tradition and modernity. As Marrakesh itself. Hannah riad offers visitors a unique experience. A mixture of Moroccan history and European comfort. Riad in all surveys in the top ten scores riads in Marrakech with a unique price / performance. Come visit us and enjoy all this beautiful Morocco. And you will find the comfort you are accustomed to luxury hotels during your visit. As European quality mattress (good for sleep). And each room has a private bathroom with modern plumbing. We take care of our customers. We love the atmosphere of fairy tale that you want to Marrakech. But we also know that comfort is important to you. NB: transfaire is given free to all customers hannah riad on his arrival and his departure has the aereport. 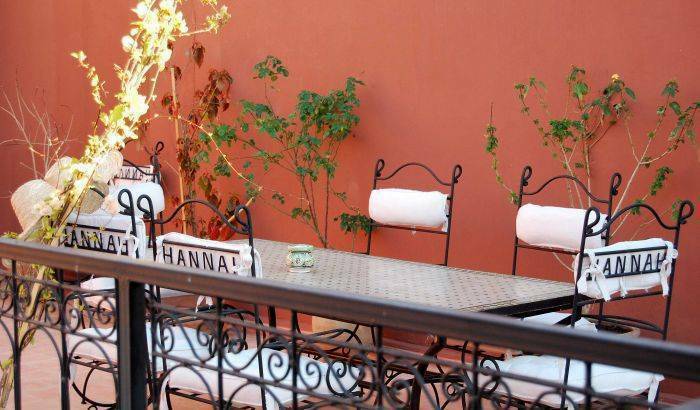 riad guesthouse or hannah said for hotels posissionnes al ancient city of Marrakech, made with great architecture and well ettudier for a pleasant stay and a fabulous cuisine, the reson for this property contains a fully equipped kitchen for dishes to your taste. sofestique bar, modern traditional, or you enjoy the taste different koctels and beverages in the world. library has books on pets. No of course we have not forgotten the sun lovers, whereas for this reson we contain a very large terrace surrounded by chese with their tables and casual dining has a Jacuzzi give very smooth. 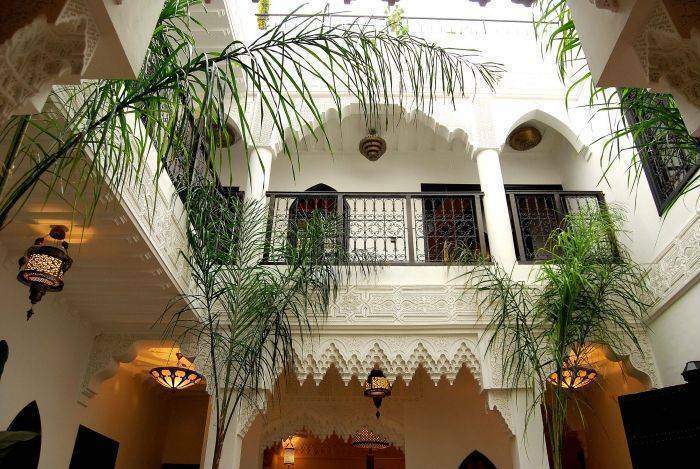 The Riad has 11 rooms, 4 of them are very old with a typical architecture, rectongulaire spacious and decorative. 7 that the rest are made of a pleasant way modernne and to satisfy customer needs during his stay, knowing that all are characterized by bagnauds showers or simple as the customer's pets. 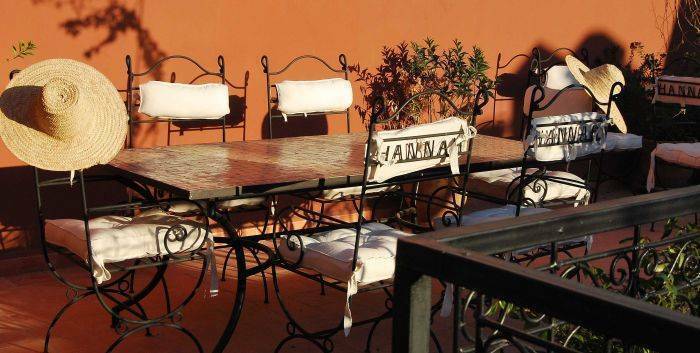 so that they all give an access to the patio of the Riad. Riad Laaroussi district is among the alumni who are in Marrakech. amazing, animated, accecibilite perfect, full of shops and artisents of different specialties. its inhabit is a hospitabilite the visitors, speakers of different languages ​​are easier for those who say the last to move or send year s important is what destination or be it the issue of dissecting the concern. for each cancellation, the customer is requested to regularize one a rise of 10% of the totality of the bill, if said cancellation is effecue in the two weeks preceding the date arivée. Our location is very easy after al location of the property. s much you can send to us asking where is that place Laaroussi riad is near Dar El Bacha, this one is a king's palace reserved for guests from abroad who are political drift, so the other side you Jamaa el Fna are giving the track ELMOISSINE, KSOR, SIDI BEL ABBASS and then at 100 to last you find it or derb Assaban citu RIADHANNAH. Train, bus, bus, minibus, taxi and carriage, which is the means of tourist transport devennu currently well after a traditional story.